Golf is a game that is and can be played by people of all shapes and sizes. It is one a few sports that does not have an age whereby you are expected to stop, i.e “hang up the boots.2 Golf is a game of pure class, touch and style. All golf clubs have strict rules and regulation to adhere to. One must wear a polo style t-shirt, no golf shoes allowed in the clubhouse, no phones allowed anywhere on the grounds etc. by adapting to these rules quickly, it will allow you to go ahead and concentrate on what’s really important….getting the ball into the hole! The nike golf tech basic dri-FIT Polo comes in a variety of colours, giving you plenty to ponder before you decide what will best suit your golf swing, your mindset and the season it falls in. These colours include: Black, Lucky Green, Midnight Navy, Olive Khaki, Orange Blaze, Pro Red, Team Red, University Blue, Varsity Purple, Varsity Blue, Vivid Green and White. Adult sizes range from XS-4XL, accommodating for all body sizes and types. 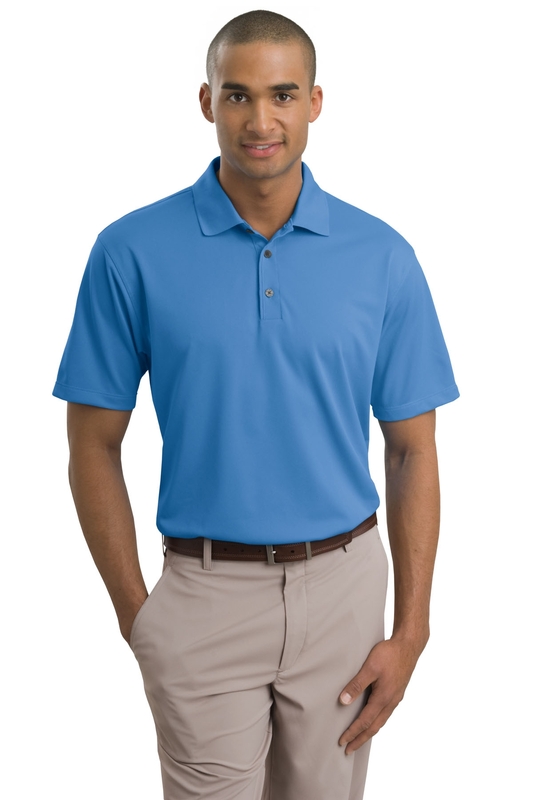 The polo weighs 5.3 ounces and is made from 100% polyester Dri-FIT fabric. The contrast Swoosh design trademark is embroidered on the left sleeve. Another feature included is pearlized buttons which complement the shirt colour, a mere shine of the colour giving it a delicate contrast. The flat knit collar give this revoloutionary polo a traditional trademark, as the collar sits nicely on the shoulder area, tieing it up neatly to complement your shoulders and chest as you take your back swing. This garment include a three button placket and features open hem sleeves. This sleeve design allows air to circulate around you during your round on the course. When the warm summer weather kicks in, the last thing you want is to be hot and uncomfortable playing the last few holes. Without the right clothing the heat can zap your energy levels, leaving you playing below your par. When it comes to choosing the best golf attire, be sure to go for something that is comfortable and breathable such as the Nike Golf Tech Basic Dri-FIT Polo shirt. Look at the professionals at the top of their game and see what they are wearing. Give yourself that extra edge on the course with the right gear and take your golf game to new levels.